(VEN) - Bat Trang Pottery Village has potential for community-based tourism due to its long history, nice landscapes and friendly villagers. 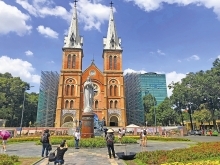 As an old handicraft village, Bat Trang takes advantage for the development of community-based tourism, Vice Chairwoman of the Hanoi Handicraft Association Ha Thi Vinh said. The village welcomed a group of Swedish tourists in early June who expressed great interests in places of worship, old quarters, craft classes and specialties. “Their positive comments have encouraged us to expand our community-based tourism,” Ha Thi Vinh said. The key to success of a community-based tourism is to identify what tourists want to visit, hear, taste and buy. Fortunately, Bat Trang has what it takes, especially for traditions and legends. Stories of Am’s and Chuc’s families, who pioneered new lines of pottery, are examples of tourist attractions. The village also boasts some doctoral candidates and university valedictorians from Ha and Le families, and skilled artisans who contributed significantly to pottery gifts and fine-art articles. “We hope tourists visiting Bat Trang will enjoy the tradition, which is told by local people, with all their heart and pride. These stories would be more interesting,” Ha Thi Vinh said. 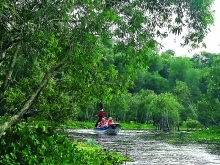 Community-based tourism models are promising for Bat Trang. However, the village should overcome the language barrier, improve tourist guide skills, upgrade local motorways, and enhance environmental protection. 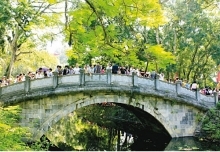 The Hanoi People’s Committee is preparing preservation and development investment projects for Bat Trang and Van Phuc. Particularly, Bat Trang will probably be extended to 120ha outside the Red River dike. According to the Bat Trang Commune People’s Committee, the commune has several communal houses and temples and two historical heritage sites - the house in Village 2 where Musician Van Cao wrote the Vietnamese anthem and Village 3 where President Ho Chi Minh visited. During the 2016-2020 period, Bat Trang will focus on upgrading cultural and historical sites as well as improving local infrastructure, offering village tours, and promoting the pottery based on local potential. 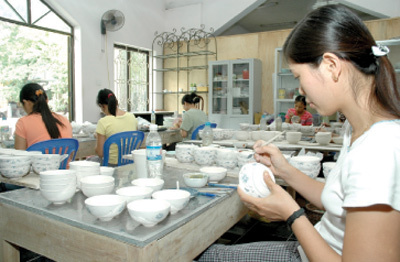 In addition to the Hanoi People’s Committee’s assistance, Bat Trang villagers should strive more to improve production techniques and design, especially for gifts, Ha Thi Vinh said.